Braveheart–What historical goof is in the movie? Clarify and simplify your study of world history and the Bible! This timeline is unique in its streamlined approach to history! It sticks to the most basic events and developments so your students don’t get lost in a deluge of facts. 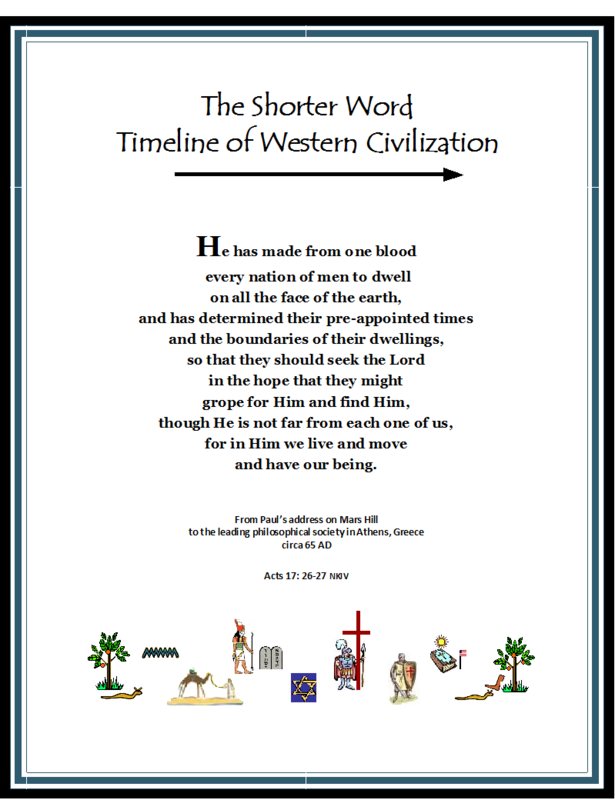 With its simplified design, the timeline offers a framework of world history that your child can actually picture and learn over time. Besides other Bible history that is used as anchors, the timeline builds the history of the kingdoms leading up to Christ around the prophecies in Daniel to show how Daniel predicted the 3 kingdoms that would follow Babylon (via King Nebuchadnezzar’s dream). These prophecies are rich evidence that the Bible is God’s word. Other apologetic-type items are emphasized–but only a few! KISS is definitely the operative word here (keep it simple, stupid). Download for free and give it a try! 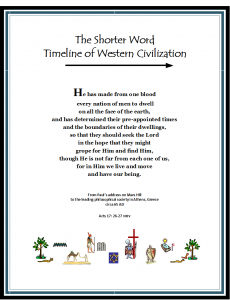 This Timeline is a great resource for Sunday school and Bible studies as well as for teaching world history. The timeline is 8 pages. Print on card stock and use clear tape to simply attach the pages to each other accordion-style so they fold out to show the whole stream of history. OR, just place into clear plastic page covers and put in a 3 ring folder. The Pack of Tricks are 15 easy to learn “tricks” for memorizing a basic framework for world history. See how the big pieces of history fit together and watch your child remember dates you never thought would “stick.” Perfect for Bible study as well as history. These tricks go along with the Timeline but can also be used as a stand alone item. If thou art reading King Alfreds English, thou shouldst clicketh here! Some people pursue happiness; others create it. Freely Educate: homeschool resources all for free. Got a Student Who’s Writing a Book? PUBLISHING TOOLS--Click here for some simple publishing tools you can use with that enterprising student (or for yourself!) to turn that story into a real book. Writing With Sharon Watson FREE weekly writing tips and wonderful writing curriculum! Grammar-Monster.com-- compact and easy to understand grammar & puntuation lessons, grammar checker, daily grammar tips, and more--all free! The Mystery of History --I think this is the best history curriculum out there! Go listen to the free sample audio lessons available for each volume and you may get hooked too.